In addition to a ballet class and one other type of dance class each day, students will explore spatial and rhythmic patterns, ratios, fractions and shapes. Using these concepts they will create dance phrases, and listen to and compose their own music using melodic and rhythm instruments. A performance piece will be presented at the end of the week. Monday – Friday 9:30 a.m – 2:00 p.m. 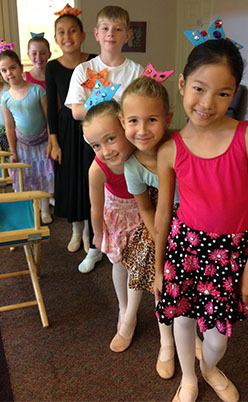 Afternoon classes are perfect for students who would like to continue their after school ballet classes during the summer months. Students are required to register for a minimum of five weeks. Mondays, 5:15 – 6:15 p.m.